Vermont's license plate motto for the 21st century could be "The Green Energy State." The state consistently ranks in the top 10 in the country for investments in renewable power, according to the Union of Concerned Scientists. Vermonters' pride in their clean energy may explain why some get irked when they see a wind turbine sitting idle on a windy day instead of generating juice. Earlier this month, a Reddit commenter complained about one tired turbine, which stands just west of Interstate 89 near the "Reverence" (Whales' Tails) sculpture in South Burlington. "I am all for wind power, but when they stop producing power, they should ... be taken down," wrote Reddit user Eastern-Kanye. "This turbine ... hasn't spun in many years." About a dozen commenters weighed in — some in favor of keeping the turbine up, others saying it's time for it to blow. One of the appeals of wind power, which is often touted as the most efficient renewable-energy source, is that when a turbine stops working, what remains is largely benign: an immobile metallic husk. The same can't be said for nuclear power plants, which leave behind highly radioactive waste and contaminated buildings, and coal-fired plants, which create reservoirs of toxic coal slurry and fly ash. Still, we were curious: Who owns that woebegone whirligig? And, if it's not working anymore, why is it still standing? The Vermont Department of Public Service, which oversees industrial wind projects, didn't respond to repeated queries as of press time. So we reached out to David Blittersdorf, president and CEO of AllEarth Renewables in Williston, who's widely considered Vermont's renewable-energy guru and unofficial historian. As Blittersdorf recalled — and subsequent research confirmed — the South Burlington wind turbine is of the same vintage as the one at Burlington Electric Department's headquarters on Pine Street. In fact, they're the identical make and model: AOC 15/50, or 50-kilowatt turbines manufactured by Atlantic Orient. That corporation was founded in 1991 by Vermonter Robert Sherwin, one of the early pioneers of modern wind energy. According to his online bio, in 1973 Sherwin founded a company in his Norwich barn called Enertech, which became one of the world's first commercially viable wind turbine manufacturers. Sherwin and Enertech helped fuel what Blittersdorf called the "California gold rush" of wind farm development in the 1980s. "They built hundreds of these turbines — and they all broke," Blittersdorf said. "The turbines weren't very good, and [Enertech] went bankrupt after the [federal] tax credits ended in 1985." The now-moribund turbine off I-89 went up in 1999 on the premises of Dynapower, which builds renewable-energy storage systems at its 150,000-square-foot manufacturing facility in South Burlington. As marketing manager Richard Morin explained via email, in the late 1990s, Atlantic Orient approached Dynapower, seeking to test its product in a cold-weather environment. According to Morin, the unit worked well "for about a decade" until it started breaking down; Blittersdorf said the Atlantic Orient turbines were prone to gearbox failures. Atlantic Orient spent thousands trying to fix it until the company filed for Chapter 11 bankruptcy protection in September 2002. Dynapower's staff attempted its own repairs, with no success. The turbine has sat dormant ever since. In December 2009, Dynapower installed a larger, 100-kilowatt turbine on its property, which, along with a rooftop solar array, now provides about 60 percent of the facility's electricity needs. Both are connected to Dynapower's renewable-energy storage system, which the company has also installed at hospitals, hotels, stadiums and ski resorts worldwide. "We've kept the older turbine for a couple of reasons. Firstly, it is a reminder of our history. The turbine was our first foray into the world of renewables," Morin wrote. "Secondly, taking down the turbine is a multi-thousand-dollar endeavor, [and] ... management felt [those funds] would be better suited to invest in the facility itself." Back in the 1990s, Vermont didn't require industrial wind developers to fund the future decommissioning of their turbines, as it does today. Small-scale residential turbines have never had such a requirement. The irony, Blittersdorf noted, is that smaller wind projects "actually make more of a mess," because their scrap value isn't worth the time and labor needed to remove them. For years, Blittersdorf drove around Vermont taking down nonfunctional turbines for free, mostly to strip them for parts. After a while, however, his salvage efforts weren't cost-effective. No such shortfall will affect today's massive, industrial-scale turbines, such as the four that sit atop Georgia Mountain, which Blittersdorf also worked on. 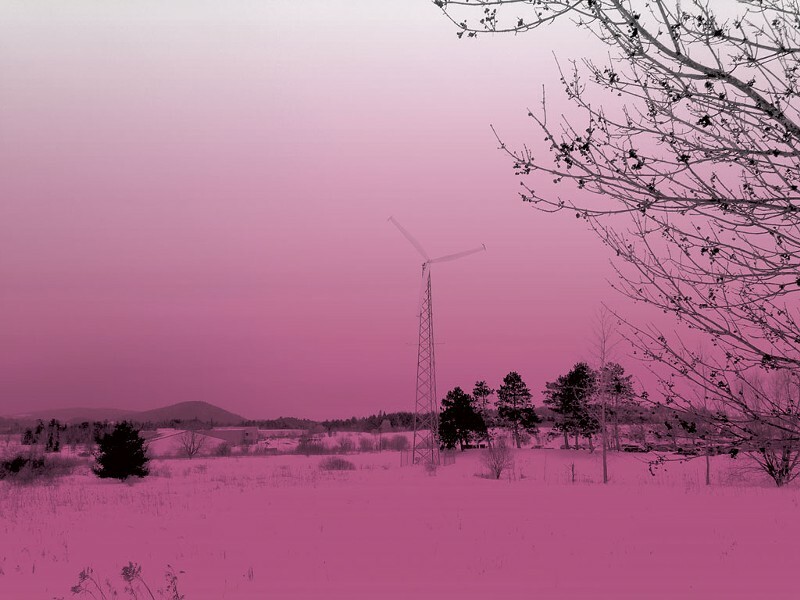 Their developer, Georgia Mountain Community Wind, pays thousands of dollars in annual fees toward the future cost of their decommissioning. Even without that requirement, Blittersdorf noted, today's industrial wind turbines have enough scrap value to ensure that they'll be dismantled. Those turbines contain permanent rare-earth magnets that, he estimated, are worth about three times the cost of turbine removal. And that removal process won't be cheap. Simply assembling the massive crane needed to install each 2.5-megawatt turbine onto its 270-foot tower took four days and 21 tractor trailer loads, at a total cost of about $250,000 in 2012, he said. By comparison, decommissioning the dead Dynapower turbine would currently cost about $10,000 to $20,000, estimated Blittersdorf, who claimed he once offered to take it down for free. "It's an eyesore," he added. "Any wind turbine out there should be turning. Otherwise, everyone thinks they don't work." Blades of glory — or blight on the landscape? Even among renewable-energy advocates, beauty is in the eye of the beholder.